Contractual disputes can be a costly problem for California business owners. When disagreements arise over each party’s rights and responsibilities under the written agreement, a skilled California business litigation attorney can help negotiate the dispute in order to avoid costly litigation. What is an “As Is” Contract? An “as is” contract provides that a particular produce is being sold in its present condition. The seller makes no promises or guarantees with regard to the product’s performance, and the buyer agrees that he or she will accept the product without such promises. “As is” contracts have a common problem known as mutual mistake. Because neither party inspects nor warrants the condition of the product, the product can sometimes turn out to be significantly more (or less) valuable than either party anticipated. When a mutual mistake is material, the contract can be voided entirely. A mutual mistake is one which “goes to the heart” of the contract that was intended to be formed. Thus, if both parties are mistaken about the very nature of their contract, a court may not enforce it. When a California business owner enters into an “as is” contract, the seller will often attempt to make the deal irrevocable. Just because a product was sold “as is” does not mean that the contract cannot be avoided. Sometimes, a mutual mistake can raise the question of which party bore the risk of loss in the contractual relationship. 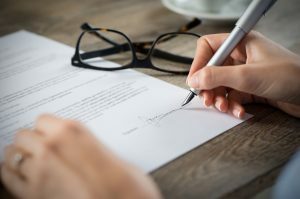 Written contracts sometimes contain provisions which prevent a buyer from accessing the mutual mistake defense (for example, if the buyer expressly agreed that he or she would accept any conditions discovered after the sale was completed). Customary business practices can also prevent a court from finding the contract to be voidable. If, for example, a car buyer does not have his mechanic inspect a lot of cars, and this is a customary business practice in the car buying industry, the buyer may forfeit his right to establish a mutual mistake with respect to the vehicles. In practice, there are different ways in which a mutual mistake can be resolved. The party seeking to void that contract can litigate the matter in court and have the contract declared void. Litigation is costly, time-consuming, and does not always bring guaranteed results. Thus, many business owners find it more effective to negotiate the matter without a court’s intervention. By helping the other party understand that the contract is unenforceable, an attorney can help facilitate the timely return of goods so that everyone can move forward with their daily operations and keep their business relationships intact. If you have questions about any contract matters, the experienced business litigation attorneys at Structure Law Group are here to help. Call (408) 441-7500, email slgadmin@structurelaw.com or use our online contact form to schedule your consultation today.